Tempe, AZ – Although the USC Trojans couldn’t miss from three point land on Thursday night, the Arizona State men’s basketball team kept their composure and pulled off a much needed win in overtime, 98-93. Throughout most of the game, and more importantly at the end of regulation, USC (8-12 / 3-4 Pac-12) seemed unconscious from behind the arc (15-28 / 53%), and hit multiple contested 3 point shots with less than 26 seconds left in the game to send it to overtime. 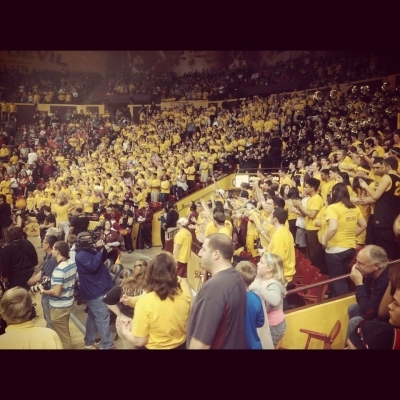 ASU defeats USC in overtime, 98-93. Here’s the best part…The Sun Devils (15-4 / 4-2 Pac-12) didn’t get rattled one bit. They maintained their focus and determination, and finished the game strong to close out the Trojans. All good signs for a team that seems to have found their identity. Although Jonathan Gilling hit some big shots in overtime, it was Evan Gordon that provided consistency and stability throughout the contest. Gordon, who has really found his confidence lately, finished with a team leading 28 points. Jahii Carson wasn’t far behind with 21, Carrick Felix added 16 and Gilling with 13. If Gordon continues to play at this level, he brings another layer of support on both ends of the floor that will continue to take some of the load off Carson and everyone else. This game was a perfect example of a team effort as timely contributions came from different players all over the floor and throughout the game. Although they should have avoided overtime, Herb Sendek had to be pleased with the Sun Devils performance and teamwork. Things don’t get any easier with UCLA making a visit to Tempe on Saturday at 2 PM. Get out to the game, this ASU team is definitely worth the price of admission.